You should care for your sunglasses like you would any other accessory or piece of jewelry. With some careful handling and maintenance these sunny-day staples can last you through many seasons. Always use your eyewear case! This will avoid frames being sat on, stepped on, or getting damaged from tossing around loosely in your purse. There are great fashionable and trendy options available now so there is no excuse not to accessorize with a case to match not only your eyewear, but even your outfit! Don’t use tissues, toilet paper or especially your clothes to clean your lenses. This is like machine-washing your dry-clean only! To avoid scratching your lenses, use a microfiber cleaning cloth and/or cleaning solution. It’s also important to rinse your lenses when cleaning them. If there is any sand or grit that isn’t rinsed off you could end up rubbing it on the lens and creating scratches. Never leave your glasses on the dashboard of your car. Excessive heat and cold can cause them to warp. And again, make sure to keep them in their case! Although we all love to do it, using sunglasses as a headband can cause them to scratch and lose their shape. Always have a professional readjust your frames. If you try to adjust the temples or the nosepiece and don’t really know what you are doing, you could easily cause them to break. If your sunglasses and eyeglasses get oily from a day at the beach, clean them with warm water and a clear dishwashing liquid like Dawn, etc. (just nothing with cream in it). This cuts grease on your lenses as well as your dishes! These helpful tips apply to all you spexy people out there who wear eyeglasses too! Stylist to the stars, Rachel Zoe, didn’t let being pregnant stand in her way of attending lavish events, covering magazines or dressing the rich and famous. In fact, the fashion guru hid her baby bump so discretely that it was almost impossible to tell she had a bun in the oven. Maybe Rachel will slow down a bit to enjoy her new bundle of joy—she gave birth to son Skylar Morrison Berman earlier last week. Whether or not the fashionista turned reality star takes a break from her hectic styling schedule, it’s safe to say that her baby boy will most likely be the trendiest munchkin on the block. The world lost a magnificent lady on March 23, 2011. Elizabeth Taylor, known for being an on- and off-screen siren, social activist and fashionista, was adored by women and fawned over by men. After winning two Academy Awards and earning her top spot in Hollywood, Elizabeth Taylor used her fame as a podium to help fight in the war against AIDS. The beauty with the infamous violet eyes leaves behind an incredible legacy that most couldn’t accomplish in two lifetimes. 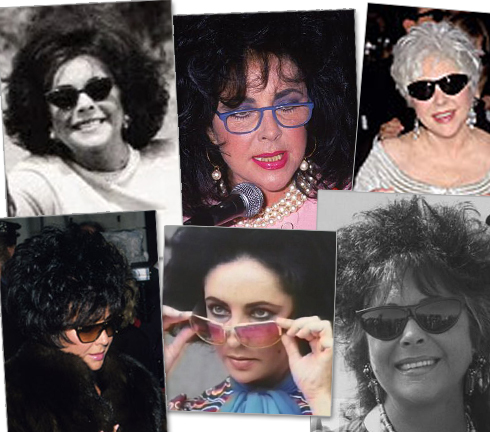 Take a look at some of Elizabeth Taylor’s most in vogue eyewear moments as she raised the bar for fashion standards. Good news for ocean and eyewear lovers alike: Country superstar Kenny Chesney has joined forces with Costa Del Mar and designed his first line of signature sunglasses to directly benefit ocean conservation. Kenny Chesney’s Limited Edition Costas come in five styles—ranging from sporty wraparounds to feminine squares—that feature unique hand drawn artwork etched inside of the frame, along with Kenny’s signature. Proceeds from the shades will go to Coastal Conservation Association to help with their efforts to protect and restore our oceans. 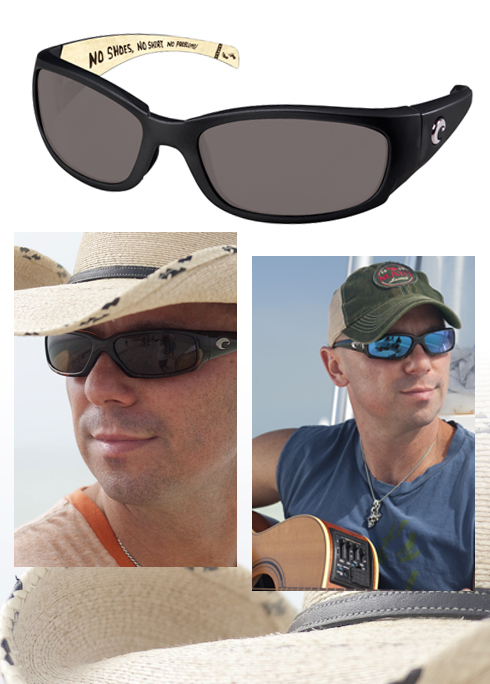 Kenny Chesney’s Limited Edition Costas are on sale now and can be purchased online at www.costadelmar.com or at any of Kenny’s “Goin’ Coastal” North American concert tour stops. If you’re in the mood to kick back in your cowboy boots, listen to an infamous country crooner and protect your eyes and the ocean in Costa shades then you’d better check out the dates for Kenny’s tour here before they sell out! The all-star cast of The King’s Speech continued to reign supreme throughout award season, with the majority of the cast being nominated for their performances at the Screen Actors Guild Awards, Golden Globes and Oscars. While two of our favorite veteran actors, Geoffrey Rush and Helena Bonham Carter, didn’t strike Oscar gold for their supporting roles, they certainly gained well-deserved recognition for their acting chops. We’ve already seen how handsome fellow cast mate and Oscar winner Colin Firth looks in eyewear, now it’s time to see how Geoffrey and Helena fared. Geoffrey never failed to show off his dapper style throughout award season, especially in retro and geek chic specs. He looks just as charming (if not more so) in a tortoise pair of Lacoste L616S shades with a keyhole bridge by Marchon Eyewear. Helena, on the other hand, sported round, blacked out sunnies on the red carpet, but it’s nice to see her pretty peepers as she dons pink, butterfly shaped Lacoste L2607 specs by Marchon Eyewear.